Wedding PR: Travel Pulse, Inside Weddings, The Knot, and more! This week, we’re looking at a great selection of new press features with everything from Travel Pulse, Inside Weddings, The Knot and more! OFD Consulting was featured on WeddingIQ with our guest blog, Nurturing Media Relationships to Your Benefit. See the full feature here. Destination Weddings Travel Group and All Inclusive Outlet was featured on TravelPulse in the roundup, What’s Trending in Island Travel? See the full feature here. Rochelle Cheever was featured on The Knot in the article, 6 Must-Dos After You Book Your Destination Wedding Location. See the full feature here. 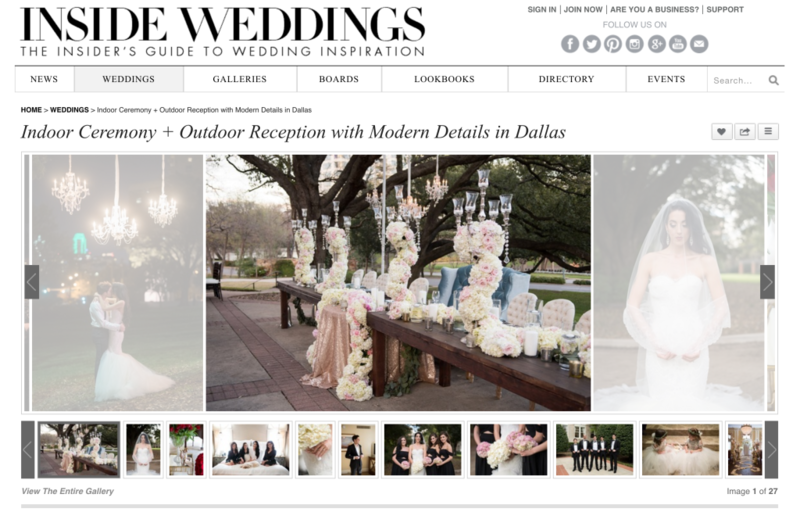 Jacqueline Events & Design was featured on Inside Weddings with their real wedding, Indoor Ceremony + Outdoor Reception with Modern Details in Dallas. See the full feature here. Destination Weddings Travel Group was featured on AllSeated with their guest article, Favorite Celebrity Destination Weddings. See the full feature here. OFD Consulting, Taylor’d Events Group, Belladeux Event Design, Be Photography, Turner Photography Studio, and Bergerons Flowers were featured in Wedding Planner Magazine in the article,When it Comes to Growth Challenges, Expect the Unexpected. See the feature here. Fantasy Sound Event Services was featured on Catersource with their guest article, Unforeseen Challenges with Acquisition. See the full feature here. Rochelle Cheever was featured on Destination I Do with her real wedding, An Effortless Tuscany Wedding. See the full feature here. The International Academy of Wedding & Event Planning, 100 Candles, and Kaysha Weiner Photographer were featured on Catersource in the article, Trend Alert: Natural Elements on Tablescapes. See the full feature here.